The Fijian delegation had a chance to discuss investment and growth with executives from some of Japan’s largest businesses, among them Sony and Hitachi, yesterday in Tokyo, Japan. 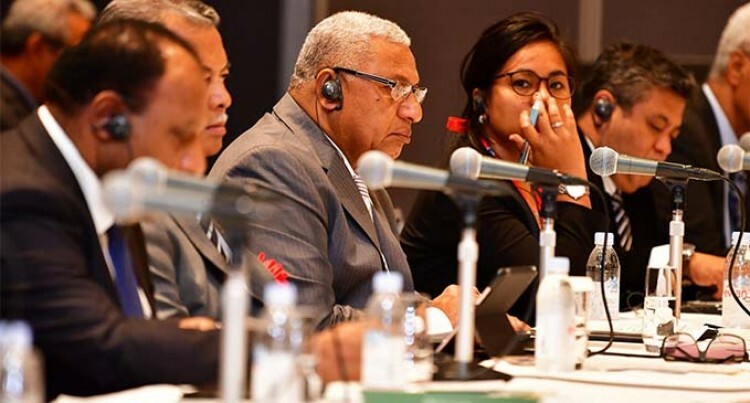 In a side Pacific Islands Leaders Meeting (PALM8) event in Tokyo, leaders addressed an important aspect in the meeting’s agenda – involving the private sector in sustainable development projects. Minister for Industry, Trade, Tourism, Lands and Mineral Resources Faiyaz Koya said Fiji’s relationship with Japan was “very important” and would aid the growth of the Fijian economy. Mr Koya and permanent secretary Shaheen Ali arepart of the delegation led by Prime Minister Voreqe Bainimarama. Mr Koya confirmed the private sector companies present were interested about investing in Fiji, saying it was “attractive” for them do to so. The Pacific leaders had a chance to talk about areas that interested them in terms of innovation and development. Mr Koya said agriculture, health and technology were some of the major topics discussed. “It was a good opportunity to catch up with several very, very large companies out of Japan,” he said. The interest from companies has heightened after Fiji announcing its support for Japan’s Free and Open Indo Pacific Strategy (FOIP), which is a foreign policy tool that prioritises open markets. For a country like Fiji with its tiny manufacturing industry and frequent natural disasters, foreign investment and exports can be vital to economic growth. The frequency of trading between the two countries is likely to increase when Fiji Airways starts its direct flights to Narita, Japan, three times a week from July 3.